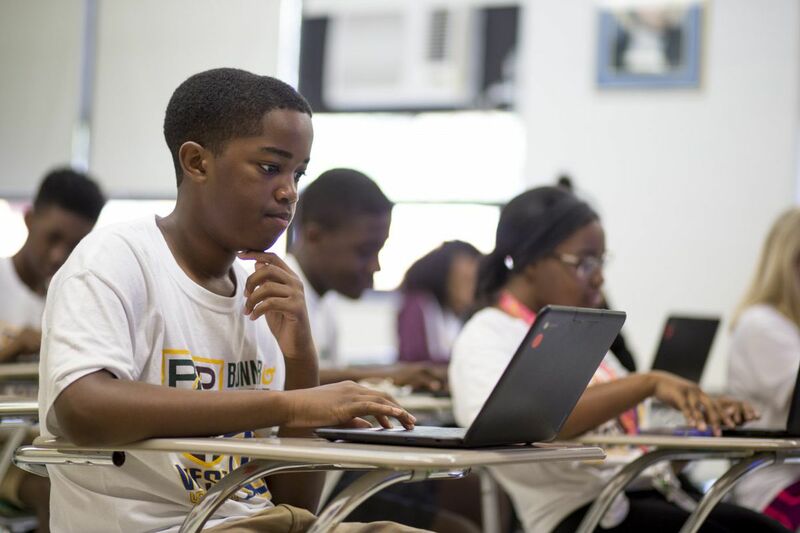 Shaun Jackson, 14, wasn't sure he wanted to spend four weeks of the summer in class at Monsignor Bonner and Archbishop Prendergast Catholic High School to get a head start on his freshman year. But he told his mother he was willing to try the Archdiocese of Philadelphia's Summer Bridge Program because it might help him learn math skills and make new friends at the school in Drexel Hill. At the end of his first day, Jackson told his mom: "I love this program so far!" The recent grad of St. Frances Cabrini Regional Catholic School in West Philadelphia never missed a day and was beaming as the program was ending last week. "I learned how to do fractions in different ways," Jackson said. "But it's not just about math. It's about all my classes." Sister Maureen Lawrence McDermott, superintendent of secondary schools for the archdiocese, agreed. She said the Summer Bridge Program was designed to boost students' academic skills in small classes and bolster their confidence to help them make a smooth transition from elementary schools to larger archdiocesan high schools. "Students are coming from so many different schools," McDermott said. "Once the school year begins, it goes off at a rapid pace." A tryout last summer at Father Judge High School in Holmesburg with students from Father Judge and nearby St. Hubert Catholic High School for Girls was a success. At a Summer Bridge reunion, several first-year alums rated the program a 10 on a 10-point scale. More importantly, all 45 participants passed their freshman courses in the last school year. The Office of Catholic Education added two more sites this summer to reach more students. With the help of a $54,000 grant from the McCloskey Foundation in Wayne, Summer Bridge returned to Father Judge, where it added spots for freshmen from Little Flower Catholic High School for Girls in Hunting Park. The program was rolled out at Bonner & Prendergast, where it offered help to students who would enrolled there in the fall, as well as those heading to West Catholic Preparatory School in West Philadelphia. Summer Bridge also operated at Roman Catholic High School, just north of the Vine Street Expressway in Philadelphia. Roman's program was open to freshmen heading to Roman, nearby John W. Hallahan Catholic Girls' High School, and Sts. John Neumann and Maria Goretti Catholic High School in South Philadelphia. In all, 136 students were exposed to the high school curriculum in math and language arts. Nylla Johnson, 14, signed up to prepare for her classes at West Catholic in the fall. "I wanted to get ready for ninth grade," said Johnson, whose mother drove her to Drexel Hill from their home in Southwest Philadelphia. "We're having fun and learning how to do our work." McDermott said that Summer Bridge's goal was making sure more students perform well in high school. Families of incoming ninth graders who school officials believed would benefit from the half-day program to shore up their skills were invited to attend. Students were tapped on the basis of test scores, elementary school academic records, as well as principals' recommendations. McDermott and Patricia Rigby, assistant superintendent for secondary schools, said they hope to find money to expand Summer Bridge in the future to help incoming ninth graders at more of the 17 high schools in the five-county archdiocese. The initial focus was students from urban schools. "Remediation isn't the answer; you need to be getting the kids ahead of time," said Joanne Walls, who is retiring as principal of St. Hubert and helped launch the program last summer with the Rev. James Dalton, the former principal of Father Judge. That way, Walls said, the students who need a boost will have heard the material before it's covered in regular classes in the fall. "My concern with students who are struggling is that they not give up and we provide them an opportunity to discover their strengths and go forward," she said. "If those four weeks gave them a leg up, we really did help them." Sessions also covered study skills, time-management strategies, and the religious culture of Catholic high schools. McDermott said Summer Bridge was designed to be lighter than a regular Catholic school day. Students wore Summer Bridge T-shirts, and time was set aside before and after school and during snack breaks for teens to socialize and make friends. Families paid a $250 fee. But as an incentive, students with perfect attendance will have that fee — plus $50 –credited toward their freshman tuition, which ranges from $7,600 to $12,500, depending on the school. McDermott said early results show that more than 80 percent of the students came every day and earned tuition credits. And Summer Bridge paid academic dividends. Jake Fagan, 15, of the city's Mayfair section, was one of the Summer Bridge pioneers from last summer who made the honor roll. He earned second honors for the third and fourth marking periods in his freshman year at Father Judge. "Summer Bridge really boosted my confidence," Fagan said. "I thought it really helped me,"
Most importantly, Fagan said, the four weeks of math gave him a head start on Algebra 1. "It was something I hadn't learned before," he said last week. "I felt the teachers put all the pieces together so I was able to comprehend it." His mother, Michele, said Summer Bridge had been invaluable for her son. "Math was the biggest help," she said. "About a week into the program, he said: 'I get it now!' As a parent, that's awesome."